"Nite Sparx Bottle Sparklers" will drive even more bottle service sales every time you deliver a bottle to a table, some may even say "it's a viral effect." - In example, when one paying customer sees a sparkling bottle being paraded around by staff and placed on a table around the club, immediately, they say, "Hey, waitress... Get us a bottle of the VIP Nightclub Sparkler!" They love the attention and intrigue it brings.....Once introduced, there is a surge in bottle sales lasting a half an hour or so, depending on how fast your staff can get the Sparkling bottles to the tables! So as a rule, the more bottle sparklers that comes out at once, the more chances of other customers placing an order for a bottle. 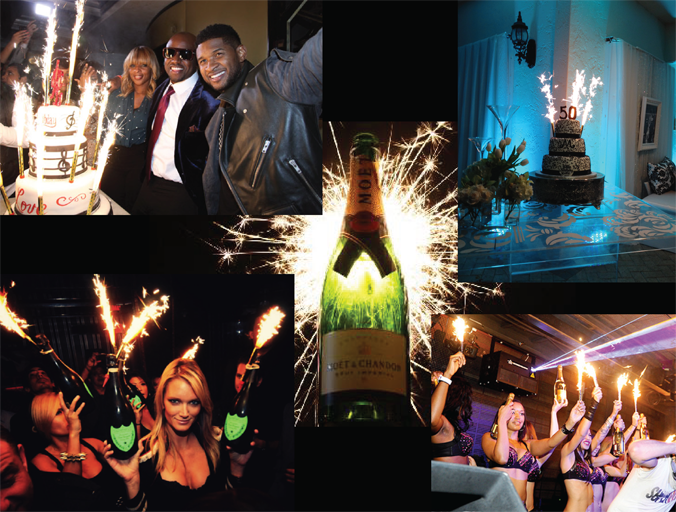 Bottle Sparklers are not only flashy and eye-catching, but also add to the attention which your VIP Clientele receives on location and add to the splendor of the evening. This is a MUST item, for any venue that wants to create an unforgettable experience for their VIP and special clients. Bottle Sparklers can be used for champagne as much as any other liquor & are geared towards the Hospitality industry. Buy Bottle Sparklers today, for your Nightclub, Lounge, Bar, Restaurant, Stage show, Wedding or Special Event to add a spark to your occasion. DON'T FORGET TO BE SAFE AND GET THE CORRECT BOTTLE CLIPS FOR YOUR SPARKLERS SO EVERYONE HAS ALOT OF SAFE FUN. Bottle Sparklers are sometimes known as Champagne Bottle Sparklers and are used in: Los Angeles, San Diego, San Francisco, Dallas, Las Vegas, Miami, New York, Atlanta, Chicago, Washington DC, Houston, Tampa, Orlando, Seattle etc... so don't wait any longer and order here now!